Kick off your visit on the 3rd (Fri): enjoy the sand and surf at Alki Beach, wander the streets of Pike Place Market, and then wander the streets of Pioneer Square. 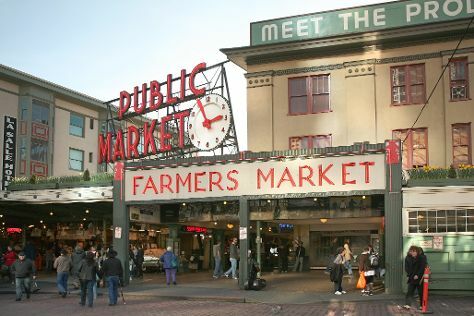 To find traveler tips, where to stay, ratings, and more tourist information, refer to the Seattle trip itinerary builder. Richmond to Seattle is an approximately 10-hour flight. You can also drive; or take a train. The time zone difference moving from Eastern Standard Time (EST) to Pacific Standard Time (PST) is minus 3 hours. While traveling from Richmond, expect slightly colder days and about the same nights in Seattle, ranging from highs of 54°F to lows of 40°F. Finish your sightseeing early on the 3rd (Fri) to allow enough time to travel to San Francisco. You'll get in some beach time at Baker Beach and Fitzgerald J V Marine Reserve. Kids will enjoy The Exploratorium and Cable Car Museum. Go for a jaunt from San Francisco to Montara to see Montara State Beach about 38 minutes away. There's much more to do: step off the mainland to explore Alcatraz Island, look for gifts at Union Square, enjoy the sand and surf at Ocean Beach, and appreciate the extensive heritage of Twin Peaks. For maps, traveler tips, ratings, and more tourist information, go to the San Francisco tour planner. You can fly from Seattle to San Francisco in 4 hours. Other options are to drive; or take a bus. Traveling from Seattle in March, things will get a bit warmer in San Francisco: highs are around 63°F and lows about 46°F. On the 8th (Wed), you'll have the morning to explore before heading back home.